Texas based Robin Guitars has been around quite awhile. They are probably best known for their Ranger model, a tastefully rendered Strat-Tele hybrid style guitar. Pictured is the Tonemonger Standard; Strat-style guitar with Robin's Desert Blonde finish- ash body. 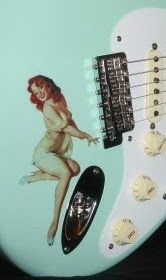 The Standard model is a hardtail with strings thru body. The trem model version features their Custom Centerpoint Trem System, with the arm connecting in the middle of the mounting plate, similar to a Jazzmaster trem-- but otherwise nothing like a Jazzmaster trem. Robin's whammy bar itself resembles some kind of mini branding iron or bbq grilling utensil... Ahh, leave it to those crazy Texans! Notice the reverse angle of all three pickups-- probably that way to maintain tighter & crisper low end tones. I'm all for that! The Robin headstock design is just right; different enough to stay out of trouble, and nothing too strange. Rio Grande pickups (another proud Texas based company) are standard equipment throughout the Robin line. Click on all the links for details and LOTS of great photos of Robin's complete line!